I am still rather concerned about the height - it shows best in the artists impression of the front view- it rises to 7 storeys. I feel that when the Durning Hall side is redeveloped that will be taken as the new acceptable level. The developers feel that there is a capacity for 10% more on street parking in the area, Residents of the Osbourne Road side may disagree! The floor plans seem to bring very little natural light and ventilation to the kitchens and inner rooms, and a nit picking point - the balconies mainly face East or West, as South would be towards the Romford Road. The existing tower block in the Durning Hall complex is 6 storeys high at one end, so i'd have thought it won't be too hard to argue precedent for slightly higher buildings. Has anything been mentioned about the Council's previous assessment that the existing block was of "heritage value"? Seems a bit of a stretch given its current state, but I have no idea what impact that has on planning. The commercial units will hopefully be a good opportunity. Perhaps a chance for some interesting independents, rather than the almost inevitable Costa. I'm all for this development, Of course it's not perfect but I think overall it will improve the area which desperately needs investment like this. I think the plans are awful to put it mildly ,they do not fit in with the exsisting buildings at all. Also the group of shops along there are all going concerns they are not empty shops but some like Barry have been in business there for years and he is the only butcher that is not Halal so where do his customers go ?and why should the locals be deprived of the shops they use . No thought is ever given to any new builds around just like the one near the Eagle and Child a total 20th century slum . There are some very beautiful buildings in Woodgrange road so why do they not just leave them alone and build the flats or whatever behind the shops , there are many people here with good ideas like the market stalls , the street festival , the community garden the coffee shops and the refurbished railway tavern they are things that improve the area a make it a better place to live we already have enough 20th century slums we dont need any more . In an area like Newham I don't see how small retailers and tenants can get turfed out of their livelihoods and homes. Regeneration and gentrification should not come at any price. Newham is awash is betting shops and chicken shops and no one has done anything about them. Yet, decent shops like Barry get the push and will not be back unless they pay the exorbitant rent that will be asked for. I look forward to finding out how much of the proposed development will be social housing. I watched a troubling programme recently on the BBC called 'The Estate We're in'. This is the sign of the times and is not right. With the exception of Barry's I can't think of another shop in that row that is unique in the area. And while it will be a real shame if Barry's is unable to relocate nearby, I think the benefits of the scheme outweigh that negative. 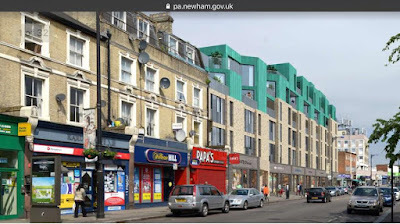 As for the architecture, it isn't particularly inspiring I agree, but Woodgrange road hardly has a coherent style, and that row of shops really isn't anything special to look at. There's obviously wariness in the community of massive regeneration/gentrification, but these plans seem pretty measured and if there's a chance to have something that isn't another chicken shop / betting shop / newsagent / phone shop that would be great. all very 60s buildings the block where Tesco and the Methodist church stand were also destroyed by bombing and if I'd had a say at the time I hope I would have said that they were also a load of rubbish . The large building that replaced the Pawnbrokers alms houses were refurbished some years ago by the only regeneration people that we have had in this area with any sense of history and style and if we could have them back I would be very happy , these buildinsg would be better of a some holiday resort abroad . If the existing local businesses are excluded due to affordability from the new premises, this poses a real risk to the local economy as the shops affected are the only ones providing the products and services they do. The character of the high street is inclusive and on the whole about small, family owned and run businesses. This is precarious at best but faced with the upgraded station area there is an inevitable sense that all prices will rise which is highly likely to create huge change, which will not be sympathetic to the long standing business such as those at risk. Additionally, the pressure on public services such as the local schools and GPs is a major concern, along with additional cars. 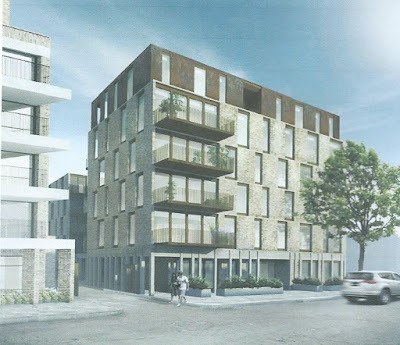 Lastly, the proposed height of the new development will surely cut out a great deal of natural light to the road and have a considerable impact on the general ambience which, whilst not perfect, at least is not dark and oppressive - yet. I own the Drycleaners on the high street for the last ten years. The area was run down ten years back we independent businesses put lot of hard work and keep high street going on the tough economic time. Because now cross rail is coming and house is cheaper then compare to other parts of London and transport links are good lots of people moving from other parts of London to here. And they what to change the area into their liking. Which is nothing wrong but not at other peoples expenses. The newsagents is been there for last 40 years. The dry cleaning business i own has been there running for last the 35 years I took over for last ten years .my advice to James is come and stay with us for a day and see how hard we work for our family like yourself and then see whether it's right. "Residents have said developer Iron Works has not publicly stated what proportion of the new homes will be social housing and the design by dRMM architects does not fit with the area’s other buildings. Butcher Barry’s Meat Market could also be at threat from rising rents as a result of the changes and six employees attended one of the two public consultations held last week to share their views. Owner Barry Parsons, 47, who has had the shop for 30 years, said the plans were a “big worry” for the future of his business and employees. He said: “I do not want to start again. They are going to take two years to do it – we wouldn’t have a business in two years. Iron Works director Daniel Harris said the comments from the meeting were “really appreciated”. He said: “Feedback from local people will help shape the final planning application we submit to Newham Council in the summer. “As discussions continue and develop with the council, we will update local stakeholders on the key issues raised at the exhibition including residential mix, affordable housing provision, transport and environmental impact. up. I thunk this development will totally dominate our High Street & destroy its feeling & soul. It is great to live in an area with lots of independent businesses. Devolpments like this inevitably bring bland chains who are the only ones.who can afford the rents. It would be such a shame if this development was to go ahead & ruin the character of the high street. I don't think Barry's Meat Market has anything to worry about. It has the greatest potential to grow as a business from possible gentrification. Which butchers do you think the influx of white middle class professionals moving into the area will support? Barry's or the halal? Don't think I need to answer that for you. Anyone who has run a successful business will know that you have to change with the times, wishing anything else is just a fantasy. Barry's future shop needs to be at least the same size as it is now. After the development, at least 2 years from its start, Barry will have to pay for two of the new shops to equal his present shop size. What gentrified person is going to shop on our highstreet anyway? They don't now! And none of us will be able to afford meat that's twice as expensive as now! Sorry, how does a butcher change with the times? Barry serves a wide range of customers giving them what they want. The butcher on Wanstead High Street shut up shop in December, after 90 years of business, because of the hike in rent. Closer to home, Black hairdressers, Debron on Woodgrange Road also closed down a couple of years ago because the landlord wanted too much money. Whose in the premises now? Subway... I think Barry and the other retailers have a great deal to worry about. Why doesnt Barry butchers have anything to worry about they are planning to demolish the whole of that block so Barrys Butchers will no longer be there so how does it grow as a business .??? Why can't we have something that complements the architectural style of the area? I'm by no means the biggest fan of the architecture, but let's not kid ourselves that Woodgrange Road is some village from the Cotswolds. I'd say the proposed building is as nice, if not substantially more so, than the existing tower blocks at either end of the road. I can appreciate that the project would have a huge impact on the businesses affected, and if i were them i'd likely protest too. But can't they attempt to relocate locally? There always seems to be places opening in the vicinity. Given that you're never going to be able to please everyone, i still think these plans seem fairly measured on the whole. The tower blocks and buildings like these new plans are what you get when people that have no idea about an area are let loose to build anything , the tower blocks should never have been built and why should well established businesses relocate just because someone wants to build another load of cr*p we used to have dance halls a cinema ,a roller skating rink and lots more things to do in this area until money became more important than happiness and a decent way of life so its about time people stopped getting chucked out of their business or home just because someone else want to make piles of money out of another load of junk and the area gets even more slum dwellings because that is what they are slums of the very near future. A few years ago nobody wanted to come to Forest Gate but that has all changed now with the coming of Crossrail. No doubt if Barry and the other shopkeepers had been told of these proposals, much earlier, they might have been able to relocate. I see that food giant Sainsburys has put in for a license on the car lot on Woodgrange Road. That will have a catastrophic effect on the small grocery shops in the area. Just a little further up on Woodford Road, hairdresser Kekeli, next door to Websters, also had to close up shop last December. She had been there for nine years and is another victim of rent increase. There is only so much small businesses can take. Shame about Barry's and some businesses having to move, but personally i think Forest Gate needs regeneration on the entire high street. I love forest gate but the high street looks old and dirty. New buildings will give the town a more fresh, clean look. I would also like to see betting stores and fried chicken shops removed, or significantly reduced. Forest gate looks old Dirty? ?Forest gate is old thats part of its charm, dirty that can be sorted if people in general played their part you cant love Forest gate and say you would like to see it all changed in the same breath that doesnt make sense Forest gate doesnt need regeneration if people want up to date modern rubbish buildings then Stratford would be more of a sensible option and why should people lose the businesses they have worked hard for just because people want to make plenty of money without working for it for years . Yes, many many people I have spoken who live in forest gate have said that forest gate looks dirty. Other towns in London are also old but they don't have a 'dirty' look about it about them. Fly-tipping and littering is a big issue in this borough. We want to live in forest gate but we want the town to look cleaner. I am constantly reporting littering and flytipping to the council but it's an endless battle. Forest gate definately needs regeneration. I work alot in developing markets, and I tell you that alot of cities in developing countries have cleaner streets and presentation than Forest gate high street/town. Yes, it would be ideal to keep the same buildings but personally, i don't think the majority of people will play their part in keeping FG clean. It's a shame for the local businesses and i understand that they've worked hard, but on the other side i think the selection of stores on the high street is poor. It's a repetition of betting stores, fried chicken shops, pound stores, phone card stores, laundrettes, pharmacies and newsagents. Not inspiring at all. New types of business, including those that promote more healthy eating need to come into forest gate. I think the overall scale of the development is appropriate for a london high street, and having a facade that is continuous with the buildings that will remain to the south will improve the streetscape and improve the high st feel- currently the single storey shops dont create a very coherent hight street. The materials look fine, and i've looked into the architects DRMM and they are very good by the looks of thinks. The flats dont look particularly nice as they all only face in one direction, either east or west. I too am concerned about the size of shops that will replace the existing. Its difficult to work out from the images but it looks like they will be big, deep units which would likely be unaffordable to anyone but the tedious, and ultimately destructive costa-pret-tesco metro crowd. With the likely development of durning hall, the worry is that this part of the high st becomes exclusively large chain stores- its safe to assume that the southern and northern end will continue to be appropriate shops for independent retailers. 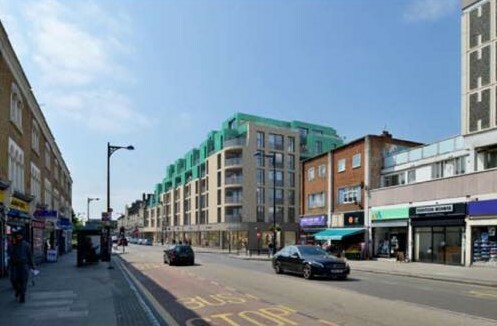 I think the challenge to the council would be to demand that somewhere in with this development and/or the durning hall development they make some provision for independent retailers, as this will what will retain the character of woodgrange road. Its the job of the council to look at the area holistically, but I think this particular development looks perfectly good on its own. Here's the principles for ALL the sites (the one discribed above, the land behind it at earlham grove, and the durning hall/coop site) which the council list in the Supplementary Planning Document (describes how Newham plan Forest Gate to change in the coming years). why, if these buildings are being demolished is there no 'new public space, to be of high quality design and landscaping'. The principles state the council's preference is to retain the existing- so why no public space in the event of demolishing them? Is this happening? Was this discussed at the consultation? local businesses, and community facilities as part of the S106 agreement. I have lived on the same road for 36 years in forest gate. how is any of this fair to anyone. and people will have to give up their lively hoods. what about the vulnerable old people and our British values , equality and diversity. we will have no banks, no butchers and certainly barrys meat market wont be there and I am a loyal customer. what do these developers really know about forest gate. and then you have people that cant even get an affordable home. and I have rad that the flats or houses they are building is going to be high rent and not affordable only to those who make 30,000 a year so how does that work. Santander I walked passed every morning to go to school opened up my first account there when I was 8. Greggs also has been there since I was 8 so why get rid of these places we all so like. why not place something there that the whole community can be involved in like giving all the shops a new look and making benches for people to sit down on. I have also seen that they are going to pave the high street which means no cars will be allowed down wood grange road I actually saw a 3d version of this months ago so they knew all this information and didn't tell anyone. I want no part of their lies they are making money to put into their back pocket. what about the employees where will they go. 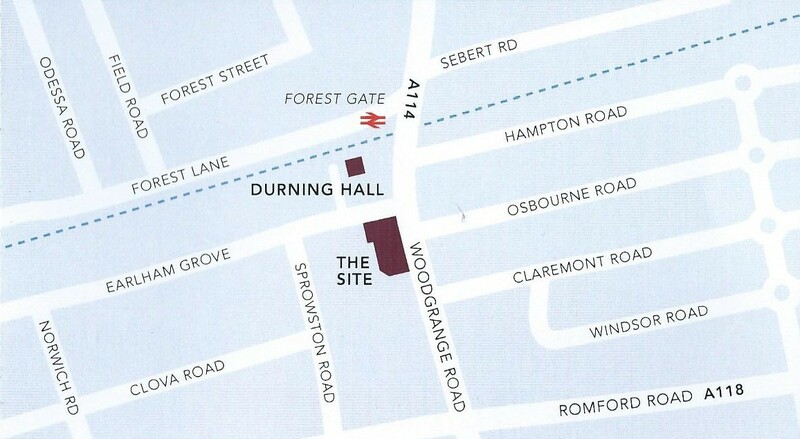 We understand that the planning application has gone in, with few, if any alterations. The consultation period has produced very few objections, and nothing very substantial from those most likely to be directly affected (e.g Barry's). The developers still hope for planning approval by the start of the ye year. Most retailers are on a max 6 months notice period and these will be run down from next January; some are already in arrears and effectively looking for their next move, or closure. The shops are now effectively "planning blighted" and investment in them has stopped by owners and leasees (although the dry cleaners is installing an ATM, to compensate for that taken out by the now-closed Santander). Empty shops will increase in number along the affected row from the new year, although it is quite likley there will be some very short term pop-up options appearing, and possibly a charity or heavy discount clearance/bankrupt stock type shop opening. All confirmed news of progress, greatly appreciated. Please add below. Three! Look again - there are five shops which are halal butchers or grocers/butchers on Woodgrange Road. On Upton Lane there at least four! I do wonder if any of them make a profit. I think the plan looks fairly well judged. We don't want really want fake victorian style buildings that fit in with the local area. More people will bring the need for more and better standard of shops and cafes. Barry's will have alot more customers when the new residents are in which will cover the increased rent. Any one know for certain if the planning went through? 1. The current parade of shops isn't particularly attractive. That said, it is hard to gauge exactly what the new proposals will look like from some vague artistic impressions. Does anyone have any examples of other projects carried out by the same architects? This might give us a better idea of the proposals. 2. I noticed the following comment with interest: "we used to have dance halls a cinema ,a roller skating rink and lots more things to do in this area until money became more important than happiness and a decent way of life". Is there any way in which the council could put a requirement on the development to ensure that there is come kind of cultural provision included (for example, a cinema/theatre/dance hall) as part of their planning permission? This could either be i. at ground level; ii. on the first floor (could we insist on such a space in place of flats at Level One? ); or iii. at the reverse of the building if an outdoor facility. 3. With regards to the impact on local businesses, i. I can completely understand the concern of Barry if he were to be uprooted for two years. I wonder if there is any way in which the council could give businesses impacted first reserve on other lots which become vacant between now and the proposal? ; ii. If the proposal increases the population of the High Street, that will surely be good for local businesses, who will have more customers? ; iii. At the Olympic Village, they took steps to ensure that the shops at ground level were independent businesses and not chains - I recognise these are all quite expensive, but I wonder if there are levers for ensuring a decent number of independent businesses; iv. Ultimately - and I recognise this is a complex issue - we as Forest Gaters decide which businesses thrive and which businesses fail according to how we spend our money. If we want to keep local businesses, then we need to keep shopping at them. Appreciate I might be very late to the party on this one. So the planning has been knocked back. Hopefully there will be progress soon as it is all getting a bit shabby as no new investment. Understandably as all to be knocked down at some point. I do think people referring to a 'Victorian high st' as if Forest Gate is some kind of historical delight is a bit much though. Is everyone looking at the same high street as me? At one time I was against the changes but now I agree with you. Woodgrange Road is going down hill rapidly. I will miss Barry but as for everything else I will be glad to see the back of it. At least we will have one less betting shop. Also, the paving on the whole road needs redoing as it is a health and safety hazard, particularly, for older people. The parade of shops and offices on the north side of Earlham Grove, running from the corner up towards the station, are the real eyesore. Seems a shame to lose the Victorian buildings (which might have been restored with some investment) while the truly mediocre, massive and dilapidated 1960s block including the old mini police station will stay in place. As for the new building and its 'retail': Tesco Express, Costa Coffee, Subway, KFC... here we come! Glad to see some progress. 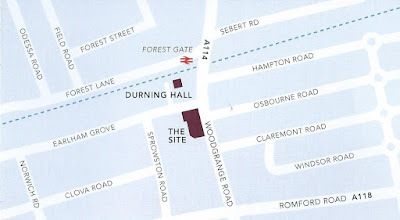 (Slightly OT -I had always though the block north of Earlham Grove plus the Co-Op was included in these plans. They are a real state, any idea what the futures holds for this bit of the high street?). I have lived in Forest Gate all my life. I was born in what was Forest Gate Maternity Hospital on Forest Lane and I for one hate the new development with a passion. It is too modern and has absolutely no soul or character. The developers have an amazing opportunity to show some real skill and imagination. Why is it impossible to blend old and new? Why is it impossible to create something characterful? The developers are not thinking outside of the box. (Excuse the obvious pun.) One high street looks very much like another these days. We could and should have so much more. I would like to see a nod to the 1880's - what they propose is so far from replicating 1880's architecture I can't even begin to articulate. Instead of making the new development look more like Durning Hall (remember the "newer" buildings on the high street were thrown up in the 60's with little thought for aesthetics)the developers should be encouraged to strive to create something that is more in keeping with the old (which in my opinion is much more emotionally satisfying). As far as I can see their "aim to be empathetic with Victorian architecture" is so far off the mark they have missed the target completely. Back to the drawing board I say. We have waited this long, we can wait a little longer. We deserve more. We deserve better. It is approved now so we are gettting what we are getting. If anything it is not modern enough. We're not in the 1880s and designing a faux Victorian mishmash would have been even worse, in my view. Overall, I am extremely pleased this development is going through. Hopefully it will be a positive change – there will be fewer slum dwellings, gambling establishments and fast-food outlets, which has to be a progressive step forward. FYI: The only retailer that has been a constant in this row of shops (Barry's Meat Market) is relocating further up Woodgrange Road to where the Siam Cafe operated previously. An update - a sign has appeared outside the shops saying Major works July 2018 for 40 weeks, so it seems that work will be kicking off soon. I think it's also now going to be a large LIDL with only a couple of other units (I saw a planning application and a sign notifying that LIDL were applying for an alcohol license). How very sad. Another ugly bland souless development replacing an eclectic mix of interesting old buildings. It's a sad day for this area. The only businesses attracted to these personalityless new builds are boring chain stores. This development will completely dominate especially if the same kind of thing is built on the Methodist Church site. So much for being a conservation area. Horrible! Ugly dark(brown) buildings..too high.too large.Bringing brutality and ugliness to the area.Earlham Grove has some beautiful buildings..why can't the developers build something beautiful? That will improve the area? I don't know why my name was omitted.. Anyone know whan this is supposed to be started? Been a long time and nothing has happened. Frustrating. The high street seems to be going backwards the last year or so! I'm pretty sure not much will happen until Crossrail has an honest, confirmed, completion date. Developers won't want to build and not be able to sell before the line is up and running. Would-be buyers won't pay top price for the "prospect" of a better transport link. So, as far as the developers are concerned, why waste money by building flats now and leaving them empty until the trains are running to the promised schedule and timetable?